The voltage of the electricity and the available electrical current in regular businesses and homes has enough power to cause death by electrocution. Even changing a light bulb without unplugging the lamp can be hazardous because coming in contact with the "energized" or "live" part of the socket could kill a person. It is illegal for anyone other than a Registered Electrical Contractor (REC) to carry out electrical work in your home* or to portray themselves as being registered. 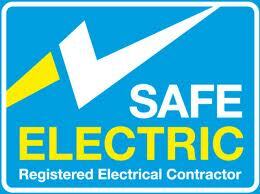 Registration under Safe Electric means the contractor is registered and insured. The contractor must issue a certificate for all work carried out. Never use a socket in the bathroom. Heaters should be permanently wired. Let steam appliances (kettles, irons) cool down before refilling with water. You will find Miniature Circuit Breakers (MCBs) and fuses in your distribution board. They protect the individual circuits that carry electricity to the various applications in your home, such as lights, sockets, immersion heater and cooker. NDZ fuses are narrower than DZ fuses and are often found in older installations. If there is a fault in the circuit or if an appliance causes an overload, the MCB will trip or the fuse will blow and all current will be cut off to that circuit. RCDs protect you against serious electric shock if there is an electrical fault in your home. They detect 'leaking' electricity from a circuit (e.g. a damaged cable or faulty appliance) and respond by disconnecting the electricity supply from the circuit. Most modern homes have an RCD fitted in their distribution/ fuse board, but older homes may need to install one. RCDs are also available to fit at a socket outlet. These should be used for tools and outdoor equipment. You should check that your RCD is working correctly by pressing the test button marked 'T' or 'Test'. If it is working, the power to all socket circuits will immediately switch off. If the RCD fails to trip, it should be replaced immediately. If you have an electric shower then there will be a separate RCD for the shower.